Your hair is colored or highlighted? Phytomillesime Color Enhancer Shampoo will be your new hair routine to take care of your hair. 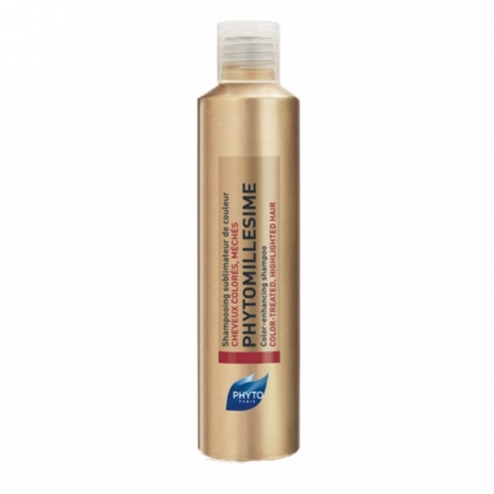 As the name suggests, Phytomillesime shampoo reveals the shine of your hair colored or highlighted. The Phytomillesime color enhancer shampoo is used in daily care and the day after your visit to the hairdresser, before your color dull and loses sparkle. The Color Locker Complex in Phytomillesime Shampoo has an anti-bleeding and color-fixing action to prolong the luster of your color for as long as possible. Red Love� Apple Extract tightens the scales of your hair fiber to strengthen it to keep coloring pigments inside the hair fiber and prevent them from escaping. The Phytomillesime color enhancer shampoo also has repairing properties of the hair fiber by tightening the scales of the latter in order to obtain a hair of incomparable softness and shine! Phyto laboratories rigorously select their plants thanks to a unique extraction method that allows you to get the best out of the plant, creating exceptional treatments. In addition to favoring plants with chemical active ingredients, Phyto laboratories limit preservatives by favoring glass and aluminum flasks. Apply shampoo on wet hair. Repeat the application by leaving 2 minutes to amplify the care action. INCI formula: Hibiscus sabdariffa flower extract. aqua / water / water. cocamidopropyl betaine. sodium lauryl sarconisate. Glycerin. pyrus malus (apple) fruit water. cocamidopropylamine oxide. PEG-2 dimeadowfoamamidoethylmonium methosulfate. sodium chloride. phenoxyethanol. PEG-15 cocopolyamine. ceteareth-60 myristyl glycol. sucrose cocoate. fragrance / fragrance. citric acid. coco-glucoside. glyceryl oleate. hexylene glycol. pyrus malus (apple) flower water. coconut acid. panthenol. phospholipids. tetrasodium edta. glycine soy (soybean) oil. leontopodium alpinum extract. sodium benzoate. oryza sativa (rice) seed protein. hydroxycitrolellal. phytic acid. potassium sorbate. Glycolipids. malus domestica fruit extract. oryza sativa (rice) extract. gluconolactone. glycine soy (soybean) sterols. tocopherol. hydrogenated palm glycerides citrate. lecithin. ascorbyl palmitate.